Child Braces: Another Exciting First! We love to track firsts. First words, first day of school, first A on a test—the variety of firsts that we acknowledge are countless. And along side the eagerness to mark and remark on firsts is the desire for your child to come to those firsts early. We all know the proud parent who informs us that their child started reading early. Why not be excited? An accomplishment at any age is something for a parent to take pride in for their child. We can approach child braces with that same excitement and anticipation that we approach every other first in life. Braces are a common marker of a child’s move into adolescence, which is an exciting (though difficult) time for parents and children alike. As the child’s permanent teeth move into place they don’t always line up properly, requiring braces to resolve the crookedness. However, that being said many orthodontists say kids should see an orthodontist once their permanent teeth start coming in, around age seven. At this age, issues such as uneven bite and overcrowding will become apparent. The good news is, starting the process early doesn’t mean a child will get braces right away. It just means the orthodontist will be able to find problems and decide the best time to start treatment. Once the treatment does start child braces are the most common way to correct alignment problems. 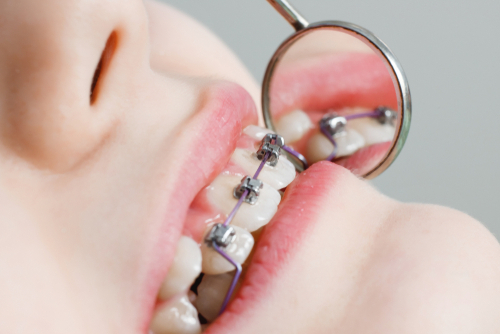 Braces put steady pressure on the teeth, which eventually moves them into a straighter position. Most kids just need braces with brackets, wires, and rubber bands. The brackets attach to the teeth and are connected by a wire and rubber bands. The wire is tightened bit by bit over time to slowly help line the teeth up properly. The rubber bands come in fun colors that kids can pick. Finally, through this process it is important to remember that your child deserves a healthy and straight smile, no matter how young they are. That’s why it’s important for you to schedule your child’s first orthodontist visit. Just count it another first to celebrate! And remember, the most important thing to help your child achieve a healthy smile is to teach them to maintain good dental hygiene. We make it convenient to schedule your appointment at Yardley Ortho! We offer regular office hours during the work week as well as offering evening and Saturday hours. Contact us today to schedule an appointment!